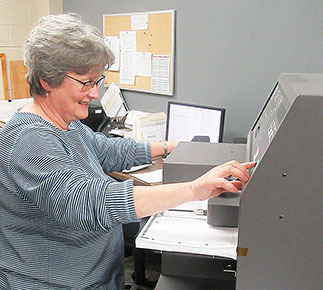 Lorrie Nicklasson, deputy county clerk, runs the St. Edward special election ballots through the counting machine. 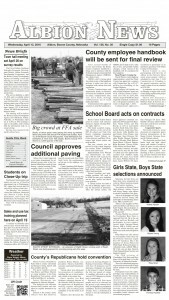 St. Edward voters approved a special sales tax this week to help pay construction cost for a new community building. The margin was 115 votes in favor of the measure and 91 opposed, or 55.83 percent in favor and 44.17 percent opposed. The 206 accepted ballots in the by-mail election were counted by about 5:30 p.m. on Tuesday, Feb. 12, in the County Clerk’s office. Ballots were sent to all 371 registered voters in St. Edward on Jan. 22. A total of 206 were accepted, while nine ballots were deemed invalid and rejected. The election was held to decide the fate of an additional one-half percent sales tax within the city limits to fund a portion of the construction cost for a new St. Edward Community Building. The building plans were presented twice at public meetings early in January. The plan calls for a 90 x 96 foot steel building to be built on a lot located across the street east of the football field. Cost estimate for the current plan is $1.3 million. The additional half cent sales tax would be expected to raise an average of $32,000 per year over 20 years, funding a city-issued bond of $460,000, plus interest. A state grant could also be available to the city. Based on population, the amount of this building grant would be $562,000. It will also be necessary to raise about $300,000 through a fund-raising campaign. Deadlines are tight for the project. The special election results were known by Tuesday night, and the grant application is due Feb. 15 to the Nebraska Civic and Community Financing Fund. Planning committee members have said the deteriorating condition of the present community center has created the need for a new building. The present building has structural deficiencies and does not meet the Americans with Disabilities Act (ADA) accessibility requirements. The new building would have a capacity of up to 520 people, with tables and chairs, whereas the current community center has a capacity of about 220 people. As proposed, the new building will be used by St. Edward Public School as a site for activities and practices during the week. The school would pay a rental fee for use of the facility. Annual rental fee of $10,000 has been discussed. It was noted that he city’s grant application for the building would score higher if the building is used by more than one governmental entity.